After 25 years as a professional in a variety of storytelling modes, I believe this is the most exciting time that there’s ever been for writers as far as opportunities and reach. While traditional publishing struggles to adjust to numerous factors, from the closing of brick and mortar bookstores to alternative avenues like Create Space, the market for other types of writing is increasing. While my 20-year background is primarily in playwriting (a field also facing challenges due to shrinking audiences and a philosophical struggle within the community of how to make plays more diverse), I’ve recently landed numerous opportunities in four other forms—work-for-hire Screenplays, Audio Dramas, Escape Rooms, and Historical–Cultural Education. Each of these has increased my financial success and strengthened my skill sets when it comes to creating story well. Make no mistake—no matter the medium of expression, what makes for a successful story applies across the boards—complex/compelling characters; a well-paced/well-structured plot with a clear arc and, when needed, efficiently implemented secondary and tertiary arcs; proper handling of exposition and tension; and a rich, enticing atmosphere. And the tools that we have used to create story—the 3-Act Structure, The Hero’s Journey, carefully crafted Plot Points, the A–K Tension Map for Thrillers, etc.— are still our best chance for success no matter what type of story we tell. How do these modes of storytelling differ? It is all in the EMPHASIS. Each has its primary emphasis. Audio Drama is all about SOUND. Everything must be conveyed through words, music, or sound effects. When I say words in Audio Drama, it is the SOUND of words—their sibilance and dissonance, their rhythms. Syntax and the pause become the punctuation that furthers the creation of atmosphere in conjunction with music and sound effects. Then there is Screenwriting. Having written 20 produced plays, I thought Screenwriting would be the closest of all storytelling forms to playwriting. Turns out that Audio Drama is its closest cousin, especially if you are a playwright who is very conscious of the beats and rhythms of characters’ language. The thing about Screenwriting is that words are things that directors have to deal with, and many don’t know how, so they hire actors who are geniuses with words—think about Tom Hanks, Vince Vaughn, Katherine Hepburn, and Al Pacino. Screenwriting is all about the IMAGE. Words are not a necessity until the IMAGES make them so. Screenwriting is the art of saying as little as possible and letting the IMAGES—the compositions, the locales, the play of light and dark, the angles and camera placements—tell the story. I hope some eyebrows rose when I mentioned Escape Rooms as a form of storytelling. For those who don’t know, Escape Rooms are an increasingly popular form of entertainment where 6–8 people in a confined space have one hour to solve puzzles to either unlock the room to “escape,” find a special item, or solve a mystery. With 6,500 Escape Rooms in the US and dedicated gamers who travel to play 50, 75, or 100+ rooms, the stakes are getting higher and the field more competitive, so some designers are hiring storytellers for a more immersive and integrated experience. As part of my duties as Creative Director at Port City Tour Company in Beaufort, NC, I create storylines for our Escape Rooms and write dialogue for actors to be part of the immersion. The emphasis here is on puzzles, so how do you create “hooks” to hang puzzles on as you tell the story? How can you tell a story that is deep but not too wide (because of the confined timeframe), which delivers story in easily digestible bits that drive action? Solving these challenges makes you a better writer of character and better at mapping key plot points. Play your local Escape Rooms and if they lack story and immersion, offer to help design their next ones. It has been an education I could not get in the finest of graduate writing programs. Each of these storytelling modes could be its own blog; each is a long journey of education, trial and error, finding good mentors and collaborators, and immersion in the best of the medium. I watch lots of films and good TV; listen to hour upon hour of audio drama; exchange ideas and techniques with other storytellers through various groups for creatives online and locally; and watch interviews/videos on YouTube that break down the media in which I work. The feedback that comes with getting your stories into the world from industry professionals and, in the case of my work at Port City, guests and Trip Advisor/Facebook reviewers, is invaluable. Over time you learn to separate the chaff from the wheat and thicken your skin and open your heart and mind for optimum feedback value. Take advantage of these growing markets. There are others in these fields experimenting with ways to make the experiences more immersive, all by focusing on how to infuse story into the specific emphases of each. Experimentation and experience in these forms will make your primary mode of storytelling all the better. Joey Madia is a screenwriter, audio dramatist, playwright, novelist, actor, and director. His poetry, essays, and short stories have been widely published and have earned him several awards. He has appeared in, directed, and written well over 100 plays and a dozen projects on camera, including the 2014 remake of White Zombie. His first film as writer/director received an Honorable Mention at the 2016 Indie Gathering International Film Festival (Cleveland, OH). His screenplay The Man at the Foot of the Bed (based on a true story by Josette Saginario) has been a two-time Official Selection, a Beverly Hills Film Festival invitee, and a quarterfinalist twice. He is Creative Director at Port City Tour Company in Beaufort, NC and Artistic Director of Seven Stories Theatre Company, Inc. (which celebrated its 13th anniversary in August 2017). He is Resident Playwright at Youth Stages, LLC. Although he has written several main stage musicals and dramas, he specializes in historical education theatre and participatory plays for youth. His 17 plays for young audiences have been produced across the United States ,and he has two plays in the Dramatic Publishing catalog. He is the author of four books on using theatre in the classroom (The Stage Learning Series, Accompany Publishing, 2007) and is working on a fifth book, Every Day is a Story All its Own, about the necessity of telling our personal stories and telling them well. He has written and performed pieces about Civil War captains Louis Emilio and Thomas Maulsby as a Chautauqua Scholar for Voices from the Earth, which does symposia and performances on the African American experience in the Civil War and he portrays six different Golden Age pirates in “Blackbeard and the Pirates of Carolina,” which he wrote exclusively for Port City Tour Co. He and his wife are the lead investigators for the Haunted Webb Memorial tour, also for Port City. As a teaching-artist he has taught and mentored thousands of students in both theatre and creative writing and has spoken at many schools and national conferences. 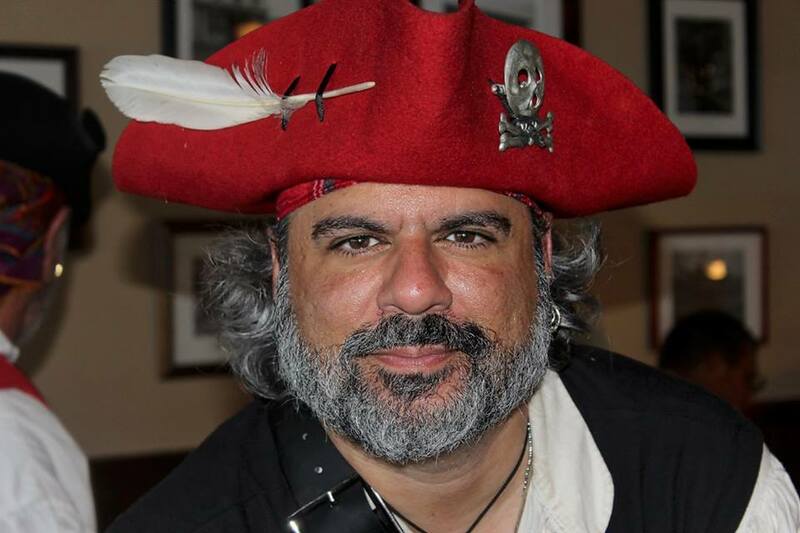 He has worked with organizations including The Epilepsy Foundation of NJ and Camp NOVA to bring theatre to students with disabilities and has won three writing awards from Very Special Arts of NJ. His first novel, Jester-Knight, was published in February 2009 (New Mystics Enterprises). He is writing the sequel. His second novel, Minor Confessions of an Angel Falling Upward was published in September 2012 (Burning Bulb Publishing). Both are available on Amazon. He is a book and music reviewer and the founding editor of www.newmystics.com, a literary site he created in 2002 that now houses the work of over 70 writers and artists from around the world. His website is joeymadia.com.